This one-minute video shows a number of moms and dads pledging to protect their teen drivers—the same way they pledged to keep them safe since the day they were born. 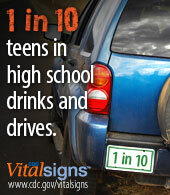 Motor vehicle crashes are the leading killer of teens in the United States. The "Parents Are the Key to Safe Teen Drivers" video offers information to help parents keep their teen drivers safer on the road.